Countdown is a UK TV words and numbers game, based on the French original, "Des Chiffres et Des Lettres", and was the first programme broadcast on Channel 4, on November 2nd, 1982. It is produced by ITV Studios at MediaCity in Salford, England, although until the middle of 2009, almost every edition was made in the Yorkshire Television studios at Leeds. The programme is presented by Nick Hewer and Rachel Riley. Until July 2005, it was hosted by the late Richard Whiteley. It was presented by Des Lynam from October 2005 to December 2006; by Des O'Connor from January 2007 to December 2008; and by Jeff Stelling from January 2009 to December 2011. Carol Vorderman appeared in almost every edition of the show from November 1982 before leaving at the end of 2008. Apart from occasional breaks for sporting events and at Christmas, Countdown is normally aired on Channel 4 from Monday to Friday at 2.10 p.m. with repeats an hour later on Channel 4+1 and the following weekday at approximately 6 a.m. (also on Channel 4). Welcome to the Countdown Page, one of the most extensive archives of Countdown results (and certainly the oldest) on the Web. Apart from the final scores of almost every show until the end of 2011, there is much more to explore, including round-by-round details of Grand Finals, a list of series champions in the Hall of Fame, over twenty-five Countdown Experiences written by former contestants and the names of all the celebrity guests to have appeared in Dictionary Corner. If your thirst for knowledge is still not satisfied, you will also find links to lots of other Countdown sites. Contributions for the programme and opinions you wish to direct to the production team should be emailed to the official Countdown email address. If you have any information you would like me to add to this page or if you have any other comments or questions about the site or Countdown, please mail me. Your correspondence is always appreciated, but while I endeavour to read every email I receive, I cannot promise to reply to everyone individually. If you would like to chat to others about Countdown (or just read their comments), please visit the C4 Countdown forum. 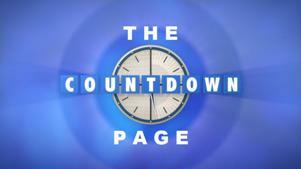 Countdown's official home on the Web can be found by going to www.channel4.com/programmes/countdown. It's also on Twitter. And if you wish to practise your word game skills online, either alone or against live opponents, why not give the legendary apterous a try? So what else is on this website, then? You can find a brief description of each section of The Countdown Page on the Countdown Contents Page. All statistics on The Countdown Page are up to date to 16th December 2011. The Countdown Page is run by Series 48 contestant Mike Brown and has no official affiliation to either Channel 4 or ITV Studios. Countdown is an Armand Jammot game.